Approaching his ninetieth birthday, President Giorgio Napolitano will neither confirm nor deny reports that he will announce his resignation by the end of the year. But even without confirmation his resignation is being taken for granted, and the fallout is already having a tremendous effect upon the entire political scene. ROME – President Giorgio Napolitano, who was born in 1925 and took office in 2006, will neither confirm nor deny the persistent reports that he will announce his resignation, perhaps during the customary New Year’s Eve speech. But even without confirmation the scuttlebutt is that it will happen, and that, as the president approaches his ninetieth year, the resignation may take effect in March. 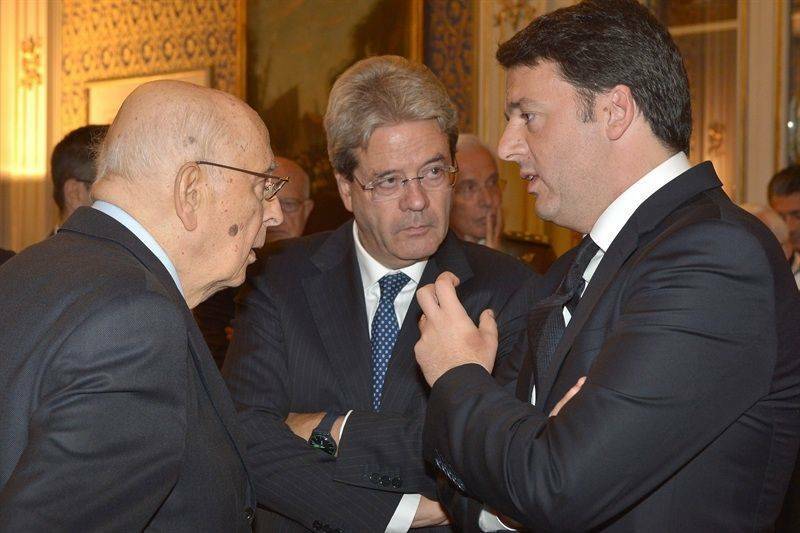 With or without confirmation, the political fallout is already having visible effects upon the present government headed by the youthful Matteo Renzi. The first is that the guessing-game scramble for a successor is underway. The second is that the hasty calling of national general elections appears to be on hold for a decent interval, and certainly until well after election of a new head of state. True, not all agree on this: Renato Brunetta of Forza Italia maintains, on the contrary, that Napolitano’s resignation “would mark the end of the legislature.” But most believe this is so. By law, a president is elected for seven years by all members of the Chamber of Deputies and the Senate plus three representatives of each of Italy’s twenty regions (the exception is the Val d’Aosta, with just one). For the first three ballots a two-thirds majority is required; after that, a simple majority. But, bearing in mind that only two of Italy’s fourteen presidents have ever been elected on a first ballot, few are banking upon election during those first three ballots. Election by a simple majority is the more likely scenario. This being the case, the relative strengths of the parties is now a hot topic. In the most recent Demos survey, Renzi’s Partito Democratic (PD) today commands 41.2% of the hypothetical vote (compared with 40.8% six months ago). This is a comfortable lead but not a simple majority without votes from other parties. The second leading party remains the embattled Movimento Cinque Stelle (M5S), with 19.6%, or significantly less than the 21.2% of six months ago. Third down the popularity list is former Premier Silvio Berlusconi’s Forza Italia, with 15.6%. However, like Beppe Grillo’s M5S, the FI has dropped down from its 16.8% of last March. Either could seal a deal with Renzi over the name of a new president; otherwise he must have recourse to the minor parties. Among these, the largest is the Northern League (Lega), which has surged up from 6.2% of six months back to today’s 8.8%. Among the names floating about as possible candidates are several clever women: Anna Finocchiaro, longtime PD (and its predecessors) loyalist; Emma Bonino of the old (and now toothless) Partito Radicale, who has solid experience in international affairs; the relatively inexperienced Roberta Pinotti of the PD; and Laura Boldrini, currently president of the Chamber of Deputies, but put down by the radical daily Il Fatto Quotidiano as “a flop,” in the kind of insult that just might make her popular with everyone else. As for the men, the names bruited about include former premier Romano Prodi; Walter Veltroni of the PD old guard; briefly premier Giuliano Amato, once close to Bettino Craxi; and Piero Grasso, currently head of the Senate. The respectable Mario Draghi’s name is being mentioned longingly, but the president of the European Central Bank seems to prefer not being a candidate. The noise in the background comes from the big trade unions, who continue to threaten a general strike; and in Rome Tuesday strikers were already out in force. Their contesting a government which at least theoretically represents the center-left is a real complication, and has riven the PD into warring camps. The unemployment rate of 12.6% in September, and youth unemployment at around 40%, explain why, but do not tell the whole story. Sociologist Franco Cassano is a member of Parliament elected in the PD lists in 2013 and the author of a new book called “Senza il Vento della Storia, La Sinistra nell’era del cambiamento” (Without the Wind of History, the Left in the Era of Change). Professor Cassano’s thesis is that the left represented by the trade unions are still locked into three glorious decades, from the Sixties through the Eighties, when Italy’s economy was in expansion, and the unions effectively represented the solidity of the economic organization. All that is over, says Cassano, and today the well-organized, self-protective unions represent a minority that has failed to come to terms with the new reality and instead try to protect an ever narrower margin of the population. They meantime ignore “the new individual dimension of autonomous work” in a labor market characterized by the self-employed and the precarious. What is needed, implicitly, is for the unions to begin a search for a new sense of social justice, different from that sought and in good measure achieved in the Seventies.